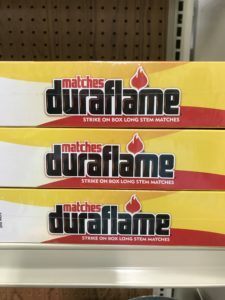 Duraflame Safety Matches are long stem matches for fireplaces, grills and other lighting needs. Check out these great savings from Duraflame where you can SAVE $2 on any one case of duraflame® Firelogs and SAVE $1 on any one case of duraflame® Firestarters, including firestart®, stix®, or quick start®. You must register on their site to print the coupons. Click here to register. These matches are available now at Argyle Feed Store. This entry was posted on Thursday, December 21st, 2017 at 12:53 am	and is filed under News & Updates. You can follow any responses to this entry through the RSS 2.0 feed. Both comments and pings are currently closed.